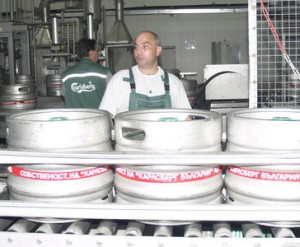 The company Carlsberg Bulgaria currently ranks second on the Bulgarian beer market, after Zagorka AD, and ahead of Kamenitza AD. The results were reported Monday by the company's CEO, Aleksander Grancharov. Carlsberg Bulgaria with two breweries, in the cities of Shumen and Blagevgrad, now has 30% of beer market in the country. The 3 companies together have a 91% share of the market. In the first quarter of 2010, the leading brand of Carlsberg Bulgaria – Shumensko had reached a 19% market share while the other brands, particularly Tuborg and Pirinsko, have also increased their sales. Carlsberg Bulgaria is one of the top investors in the Shumen Region and in Bulgaria. In 2009 the company invested BGN 22 M in the Shumen and the Blagoevgrad breweries and plans to invest another BGN 15 M in 2010 of which BGN 5 M will be in Shumen, rounding up the total investments there since 2004 to BGN 75 M.